Cilantro is an herb that’s a lot like coxing a Four: you love it or you don’t. The flat-leaf herb has a deep sultry spice that stays on your tongue and can draw you into a world of flavor that’s new and exciting. A regular player in the world of salsa, cilantro makes an appearance in this tabouleh recipe, kicking out the parsley that’s more commonly used. 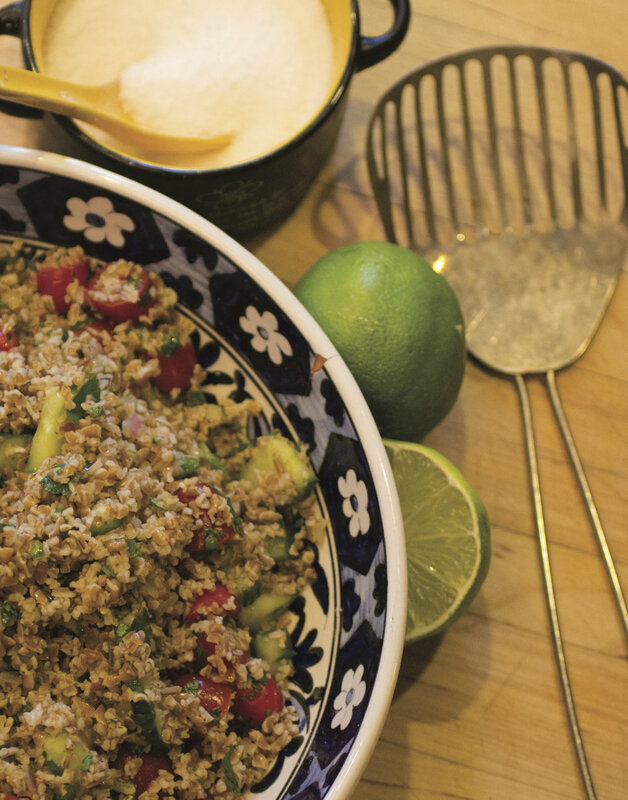 It’s a fresh twist on the traditional Middle Eastern grain salad. Grab two bowls: one for the grain to soak and one to let the veggies and dressing blend together. Make sure one of the bowls is big enough to hold all the ingredients–your dishwasher will thank you for thinking ahead. In bowl #1: Combine 1 cup bulgar wheat with 1 2/3 cup boiling water. Cover and set aside for an hour. In bowl #2: Combine the olive oil, lemon juice and veggies listed below. Cover and put in the ‘fridge for an hour. After an hour, mix the contents of both bowls together. Your tabouleh can rest in the ‘fridge for several hours before serving, or can be enjoyed immediately. Cover and chill any leftovers, the flavor will be even better on day two! This makes a great snack on the bus or at a regatta. Per serving (approx. 1/2 cup) 152 Cal, 10 g Total Fat, 1 g Sat Fat, 199 mg Sod, 16 g Carb, 0 g Sugar, 3 g Fib, 0 g Sugar, 3 g Prot.